SCCD Board Chairman Ray Warriner, SCCD Manager Jim Garner, Deputy Secretary of Agriculture Gregg Hostetter, Tom Yoniski from Senator Lisa Baker’s office, Representative Tina Pickett, Representative Jonathan Fritz, SCCD Associate Director Lillian Theophanis, SCCD Director Bill Bayne, and SCCD Director Curt Hepler. Photo provided by SCCD. 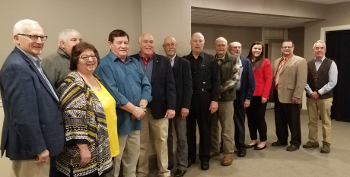 Recently the Susquehanna County Conservation District (SCCD) held its 2018 Legislative Breakfast at the Montrose Club. The legislators attending spent time discussing many current topics with directors and staff over breakfast. District Manager Jim Garner gave a presentation highlighting conservation district programs and related funding. Board Chairman Ray Warriner provided closing remarks and thanked our legislators for all of their support. Cumberland County Conservation District Farmer Director Mike Berkheimer, State Representative Dawn Keefer, and Carl Goshorn. Cumberland County Conservation District Manager Carl Goshorn visited five legislators at their home offices over the last two weeks. Beth Lutz, Ag Conservation Specialist; Angie Foltz, Program Specialist; Nate Weaver, E&S Pollution Control Technician; Amy Cannistraci, Ag Conservation Specialist; Katie Doster, District Manager; Randall Leisure, Board Chairman; Brenda Shambaugh, PACD Executive Director; Kori Walter, District Director for Congressman Costello; Jill Weister, District Office Manager for Representative Diamond; Teresa Leitner, Legislative Secretary for Representative Helm. Missing from picture: Representative Frank Ryan, Commissioner Bill Ames, and Commissioner Jo Ellen Litz. Photo provided by LCCD. On Friday, June 1, PACD Executive Director Brenda Shambaugh joined staff from the Lebanon County Conservation District (LCCD) to meet with local legislators, including Representative Ryan, Commissioner Ames, Commissioner Litz, and representatives from the offices of Congressman Costello, Representative Helm, and Representative Diamond. During the meeting, LCCD staff highlighted conservation efforts in Lebanon County over the past year. Staff discussed agricultural programs, erosion and sedimentation programs, agricultural land preservation, the Lebanon County Envirothon, and the LCCD Annual Tree Sale. The group also discussed legislative matters important to the Lebanon County community, including the current Farm Bill and the Chesapeake Bay Watershed. 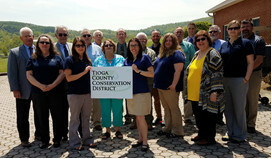 The Tioga County Conservation District staff and board members, Tioga County Commissioners, a representative from Senator Scarnati’s office, PACD Executive Director Brenda Shambaugh, and Tioga’s new Representative Clint Owlett pose for a photo. On May 18, 2018 PACD Executive Director Brenda Shambaugh traveled to Tioga County to attend a legislative event. The 2018 Tioga County Conservation District legislative luncheon was held at the Tokishi Building in Wellsboro. The district highlighted upcoming projects for their area and answered questions about programs throughout the county. (Left to right): Senator Gene Yaw, PACD Executive Director Brenda Shambaugh, LCCD Director Bill Kahler, LCCD Chair Carl Schlappi, PA Representative Jeff Wheeland, LCCD Director Cam Koons, LCCD Vice Chair Paul Wentzler, LCCD Director Bill Messersmith, LCCD Director Joe Radley, Congressman Tom Marino’s office staff member Ann Kaufman, LCCD Manager Mark Davidson, and PA Representative Garth Everett. 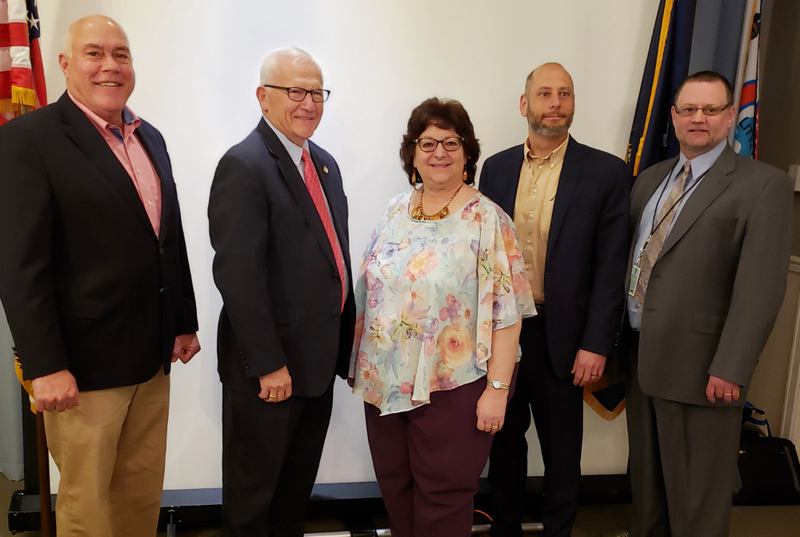 On April 19, Lycoming County Conservation District held a legislative breakfast. PACD Executive Director Brenda Shambaugh traveled to Williamsport, PA for the event. Three legislators in attendance spoke about how they are supporting conservation and agriculture. Click here to read a news article on the event. Top left photo (left to right): Chester County Conservation District (CCCD) Agricultural Team Leader Dan F. Miloser, CCCD Urban Team Leader Gaye Lynn Criswell, PA Representative Becky Corbin, and CCCD Manager Chris Strohmaier. Top right photo (left to right): PACD Executive Assistant & Meeting Planner Molly Burns, Sullivan County Conservation District (SCCD) Manager Holly Miller, PA Representative Tina Pickett, and SCCD Director Joanne Day. Bottom photo (left to right): McKean County Conservation District (MCCD) Manager Sandy Thompson, MCCD Commissioner Director and PACD North West Region Director & National Association of Conservation Districts Director Cliff Lane, PA Representative Martin Causer, MCCD Director Steve Sherk, and MCCD Director Blaine Puller. 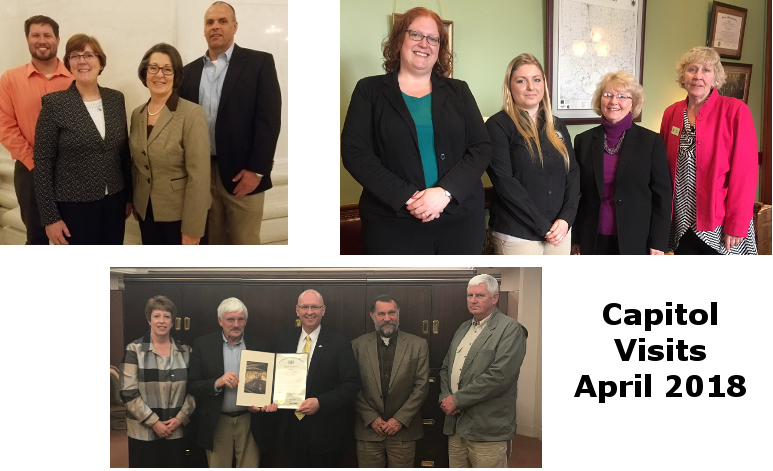 As part of Conservation District Week, conservation district directors, associate directors, and staff from Chester, McKean, and Sullivan Counties visited Harrisburg on April 17, 2018. 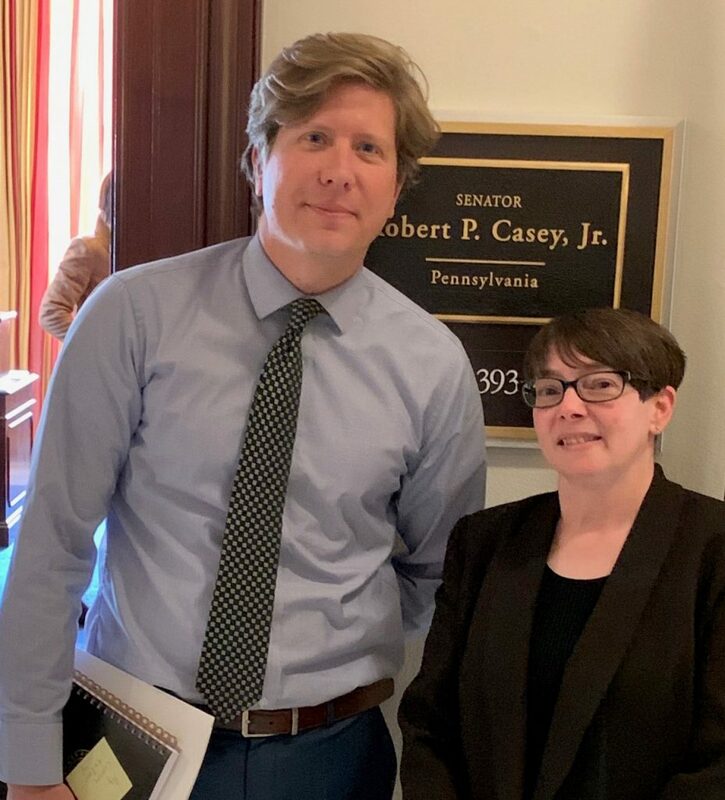 PACD Executive Director Brenda Shambaugh and Executive Assistant & Meeting Planner Molly Burns met the district representatives at the Capitol building for a day of meetings with legislators. The conservation district representatives met with legislators to thank them for their support and to ask them to include full funding for the districts in the 2018-19 budget. 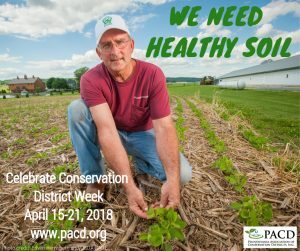 The Pennsylvania State Senate and the House of Representatives declared April 15-21, 2018 as “Conservation District Week.” The dates coincide with Earth Day (April 22nd) events and celebrations. 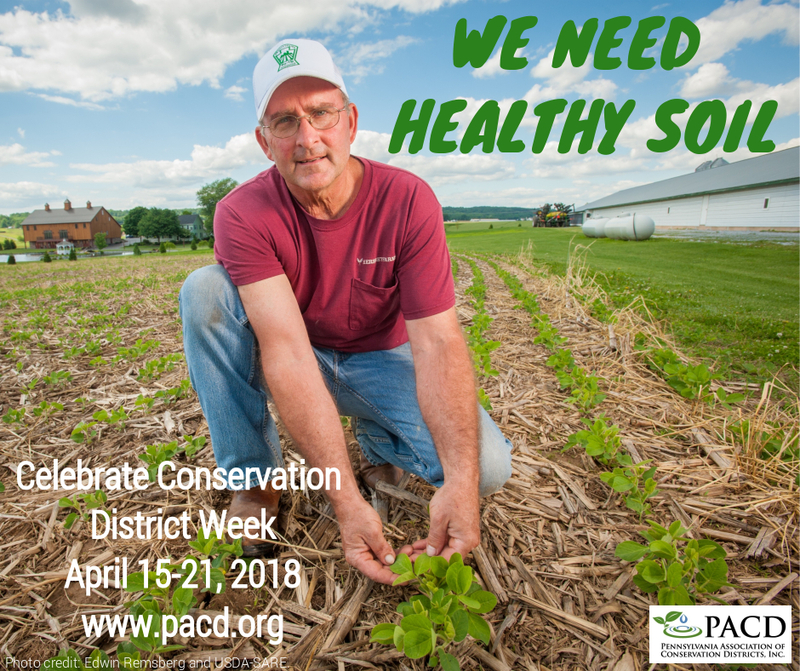 During Conservation District Week, offices across the state will hold events. These events will show the projects conservation districts work on every day that control pollution. Each county has a conservation district office except Philadelphia. These volunteer directors and staff live and work in your area and target local conservation problems. These are your neighbors who are working to ensure there is enough clean water. They also make sure we have healthy soil for the future. That deserves to be celebrated! Conservation districts thank members of the PA House and Senate, as well as the Governor, for supporting the districts by providing the funds necessary to preserve and protect our Commonwealth’s natural resources through the budgetary process.